Upper Deck e-Pack™ users can score this topical new set with achievement rewards for fans who collect them all! Every week of the 2017-18 NHL® season, Upper Deck will pick the top moment(s) that will be used to create physical trading cards. We encourage fans to share what they want to see captured on Game Dated Moments cards by tweeting to @UpperDeckHockey using the hashtag #PickTheMoment. 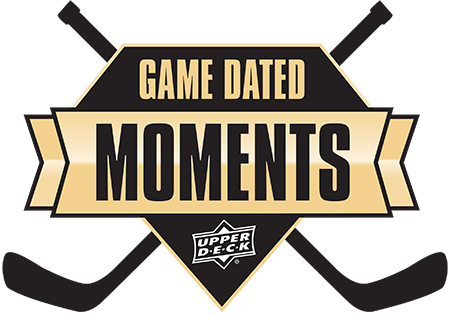 Every Friday at 9:00 a.m. (PST), new Game Dated Moments will be announced and made available to purchase in a one-card-per-pack format along with the simultaneous purchase of any other non-Game Dated Moments hockey trading card product at www.UpperDeckEpack.com. Adding a hockey trading card product to a user’s cart will allow them to simultaneously purchase the Game Dated Moments pack(s) and allow users to add up to one of every available Game Dated Moments pack(s) to their purchase. Each Game Dated Moments pack will be available to purchase for $3.99 per pack. Packs will only be available for one week before they are retired the following Friday at 8:59 a.m. (PST). Once purchased and opened, Game Dated Moments card(s) will be added to the customer’s e-Pack collection as a digital card until the production process has been completed. Collectors will receive an e-mail update letting them know their card(s) has been enabled for shipping approximately 3-4 weeks after the corresponding pack has expired. Fans will then have the option to ship their order, or transfer them to a linked Check Out My Cards (COMC) account (additional COMC fees may apply). The Game Dated Moments program will launch on October 13 at 9:00 a.m. (PST) showcasing the top moments from the past week in the NHL®. All imagery will come from the game where the moment transpired. Cards will include copy about what made that moment so great on the front and back, along with the date it took place. All Game Dated Moments cards will be premium quality in line with other core Upper Deck trading card releases and include the Upper Deck hologram on the back. Collectors who complete the designated sets of Game Dated Moments cards will be eligible to score exciting achievement cards so fans won’t want to miss a week to put together this first of its kind NHL® set. More details on achievements will be available soon! Collectors can own the moment by purchasing the new 2017-18 Gamed Dated Moments cards in conjunction with their purchase of other hockey trading cards beginning on October 13 at 9:00 a.m. (PST) exclusively on www.UpperDeckEpack.com. NHL® and the NHL Shield are registered trademarks of the National Hockey League. All Rights Reserved.